4 mealworm lollipops : apple, orange, blueberry and banana. What's more original than this assortment of mealworms lollipops? It will you give the perfect opportunity to sample several flavors, all in one package and without having to choose beforehand. Fruity flavors in perfect entomophagous blend, we have something to suit every taste. 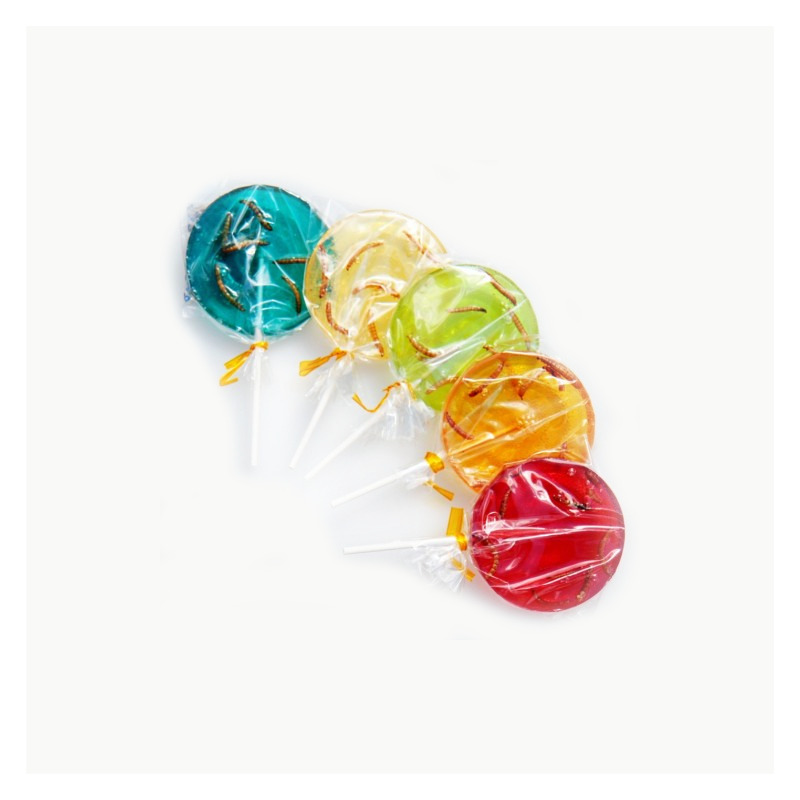 This pack contains 4 mealworm lollipops in 4 different flavors : apple, orange, blueberry and banana. Have you heard about our latest news ? A new kind of candy just hit our shelves. What may appear as a simple candy but which is so much more too. An all new way to revisit an old treat! Some people still find the idea of eating insects a bit awkward, especially worms. But our shop gives you the opportunity to see them in a more appealing shape. Think about it! A surprising blend between the sweetness of a wonderful candy, the savory flavors of the fruit that perfumes it and the crunchy-chewy texture of its main ingredient, a recipe for greatness! Moreover, the flashy color of each mealworm lollipop only makes them even more appetizing. To convince the most skepticals among you, we will let you know mealworms, as for worms in general, are rich in many different nutrients. And as such they have already become an essential part of the daily diet of numerous people living in Asian countries. And don't worry, these lollipops have been made with edible worms cleaned and cooked in compliance with the most severe international health and hygiene standards. Mealworm lollipops : Designed for children and grown-ups. Our Mealworm Lollipops Pack comes with several small amber-like lollipops with a worm inside. A treat sure to arouse the curiosity of both your children and your friends. The fact that several lollipops have been added to this pack will certainly encourage you to share them around too. And thanks to their fruity taste and a unique color for each lollipop, you are sure to stimulate your brain by making a playful association between each color, the fruit that matches it and all the pleasures you will feel by tasting it. Once you take a bite of the crystallized worm inside, you will finally experience something new. You will experience a new texture but also a new flavor, different from meat or eggs, but we are sure you will like it. And through our lollipops, you will be helping others discovering what kind of flavor mealworms have, a big step towards promoting entomophagy to those still feeling reluctance or fear at the idea of eating insects. You want to offer something truly original for next birthday? All the while avoiding "cliché food-gifts" ? What you want is to offer a something that will surprise, amaze the person who receives it? Well... this pack full of fun lollipops certainly foot the bill. The mealworms placed inside each lollipop will attract both the eye and the curiosity and is garanteed to amaze everybody. And likewise, you could help your whole family by introducing them to the fine art of eating insects. By inviting them to do so through one of our special treat you will easily get them acquainted to a new diet soon to change the world! 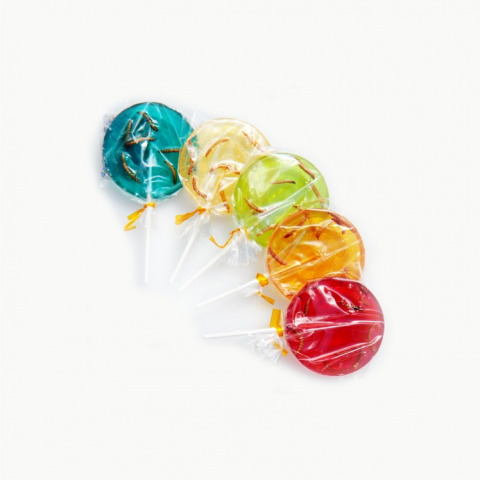 Your family may dither and feel undecided about it but thanks to the appealing shape we gave to our lollipops, curiosity is bound to take over and motivates them to take their first step toward trying some edible bugs. One of the main purpose when offering a gift is not to offer others something they already possess. And our edible insects are certainly something few among your peers have ever dared to try. So, buy one of our pack and share them with as many of your friends as possible. Our shop : Best provider of original and strange treats. Entomophagy, or what can also be described by being the idea of human beings eating insects, is a practice beginning to gradually appear in Western dishes .. As a matter of fact, few shops even offer them for sale yet and even if some do, like us, very few people still dare to taste our products. However, edible insects' appearance on our menu in the near futur is more than likely. Our shop has been a leading expert ont the matter of edible bugs since its creation, back in 2009. One of its main goals is to introduce Westerners to the practice of eating insects. And what better way or incence is there than by starting with the most attractive forms of introduction to strange food : candies or more accurately, edible insect candies. Find out more in about edible bugs by taking a look through a variety of insect sweets only available in our shop. We offer lollipop packs in multiple colors and scents, all starting at 14 euros. Sate your curiosity and your appetite for out of the ordinary food with our incredible mealworm lollipop.